Throughout my first season writing for Call to the Bullpen, I wrote several articles focusing on specific statistics or scenarios, looking at their current status on the day the articles were written. Some of these I was able to look back on later in the season, updating them, and being able to analyze why any changes had been made. Now that the 2015 season is over, I will be releasing a series of articles looking back at these topics and filling in how these all looked with a full season to back them up. The first item I wanted to take a look at is the topic of what is the best type of hitter to bat second in the lineup. To read my introduction to the topic, you can read here. In brief, some statistical analysis shows that a team’s best hitter should hit second in the lineup. Others believe the historical trend that your best hitter should hit third. I grew up having Frank Thomas as my sports hero and he is one of the best hitters to ever play the game. I always remember the Big Hurt hitting third and at no point did I move him up to second in my lineup when I played his video games. It’s that thinking that may make me old school but I chose to take a close look at what a few teams did this year and how much success they had. In my initial article, I chose three American League teams to look at. I mentioned in the conclusion of the article that I should add a National League team to my research, due to the DH rule difference creating a much different lineup strategy. The first team I want to take a look back at is the Angels. The Angels are such a fascinating scenario and basically influenced my idea for this article. Mike Trout was the best hitter in the majors headed into this season; he still may be, if you take him over Bryce Harper. (For the record, Harper did not hit second all year, but the Nationals are not one of the teams I analyzed). I dove into deciding how true that second argument is. Since we’re starting on the Angels, I will bring up their numbers first. The batter in the second spot of the order came up to the plate second in an inning 292 out of 678 times, or 43.07%. Now if a lineup was random, we would see that number way closer to 1 out of 9. You can say that it is more likely not to happen, but the second hitter in a lineup hits second in an inning more than any other scenario. So, the most likely scenario is that your #2 hitter will come up second in the inning and this helps the first argument more than the second. The Angels were a very scintillating team to analyze this season regarding this situation because of their treatment of lineup construction. Mike Trout, who was the number two hitter 155 out of 157 starts in 2014, started Opening Day 2015 in the same spot. I figured this would be an all-season thing and I was simply going to investigate Trout’s situational hitting. 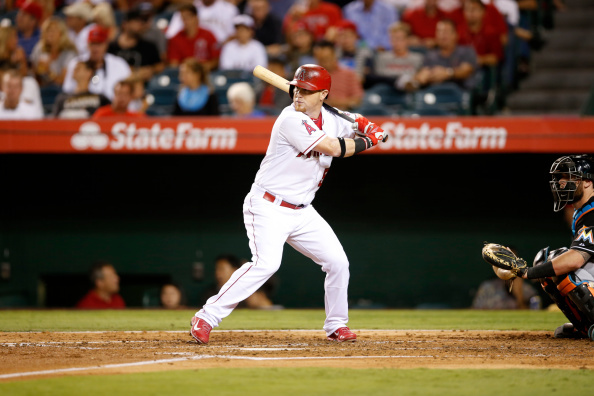 Not so fast – in game 65, Kole Calhoun was placed second in the lineup and it wasn’t just a one day thing. Calhoun hit second for nearly 60 games with Trout moving to the third spot. Trout was then moved back to the second spot for twenty games. But then for the final 20-odd games, Calhoun was moved back during the Angels last stretch of almost sneaking their way into the playoffs. Clearly other lineup factors may have influenced Mike Scioscia’s lineup construction, but something had to change his mind on Mike Trout being his everyday #2 hitter. Let’s take a look at how these two did when batting second in the order all season. First Trout – Trout had 29 plate appearances with a runner on first and no outs. In a traditional baseball sense, the job there is to move the runner over even if it is sacrificing your at-bat. I won’t fully argue the use of a bunt in this article, but sacrificing your at-bat doesn’t necessarily mean a bunt. Trout was successful 10 out of the 29 times. With a runner on second and no outs, he was successful advancing the runner one out of three times. With a runner on third and no outs, he was not successful in two at-bats. The other side to look at is just from a batting average sense, Trout was 5/28 with a runner on first and no outs (the other five successes in advancing were reaching on error, one walk and two groundballs that advanced the runner). 34% isn’t a great rate for advancing a runner yet it still looks like even the effort of attempting to advance the runner hurt Trout’s average. This could possibly be the reason that Scioscia made the move to Calhoun. Kole Calhoun had 26 plate appearances with a runner on first and no outs. He successfully advanced the runner six times for a 23% rate. He was more successful with a runner on second and no outs, advancing the runner three out of four times. He was one for two with a runner on third and no outs. Calhoun’s average didn’t take a hit as that 6/26 rate was his batting average as well. Calhoun certainly didn’t make the moving of Trout to the third spot a no-brainer but for some reason Scioscia kept the lineup this way and even had it during crunch time in September. It does seem that he may have been convinced that the traditional lineup setup was the right way to go. One side note – the Angels GM resigned during this season and if anyone thinks that may have coincided with the lineup change, I suppose it is possible. Calhoun was moved to the second spot on June 16th and Jerry DiPoto resigned on July 1 due to alleged arguments with the manager. The next team I’ll look at is the Oakland A’s. I chose the A’s because their GM Billy Beane is one of the founding fathers of Moneyball and if anyone were to use analysis towards lineup construction, it would be him. Going into Opening Day, it seems like they did not have a set person for their number two spot. The first five games saw five different players hit second. After game 5, a 3/5 day by rookie Mark Canha solidified himself into the everyday lineup as the second hitter. It didn’t last long – game 19 saw Marcus Semien, a more prototypical number two hitter, in the second spot and he stayed there for around 30 games. The next 26 games saw seven different hitters in the second spot with none longer than four consecutive games. Finally, in game 79 catcher Stephen Vogt was put in second. He held the spot for 22 games and then the alternating came back. In game 116, manager Bob Melvin went back to Mark Canha, who remained there throughout the end of the season. For all number two hitters on the A’s this year, they hit second in the inning 305/726 times or 42%, right in line with the Angels. Here is each player’s success rate at advancing the runner. Vogt did pretty decent in his July stint in the second spot but possibly was moved out due to the desire to get more power out of him after 14 first half homeruns. This may have even hurt his approach as he only hit four homers in the second half. Marcus Semien wasn’t nearly as successful and eventually moved back to the end of the batting order. Mark Canha was solid in situational hitting and it looks like Bob Melvin went with the old school approach which in all likelihood was backed by Mr. Moneyball. The last American League team I took a look at was the Chicago White Sox, mostly for personal reasons. The White Sox started Melky Cabrera in the number two spot as it seemed to be that is exactly what he was acquired to be. Cabrera held it for roughly the first 52 games but infamously struggled and hit well below expectations. Alexei Ramirez, who had been tried in the same spot in 2014 to mixed results, was the next best option but only given a handful of games before the next change. White Sox twitter, which I admit I am a part of, was strongly for moving Jose Abreu to the second spot to follow the strategy of that is where your best player should hit. Abreu succeeded right from the start. However in Game 84, the White Sox called up a lesser-known prospect by the name of Tyler Saladino. He was immediately put second in the order in his first game in the over-hyped crosstown series with the Cubs. Saladino was a breath of fresh air and did find some early success. As he started to lose his early luster, fans again started screaming for Abreu to return to the role. Manager Robin Ventura almost seemed to be trolling the fans as he went back and forth between Abreu and Saladino with also mixing in Melky Cabrera and Alexei Ramirez. Ten of the last twelve games saw Abreu hitting second. Jose Abreu had a slight edge on the numbers; that can’t be too surprising as he is the most prolific hitter on the team by a large margin. However, he is also the team’s best RBI man and even with a slight downgrade to the second-best Alexei Ramirez, Abreu is probably better having the table set for him than setting the table himself. I added two National League teams after writing my first article because I wanted to see if the lack of a designated hitter, and in turn, mostly hitting a pitcher ninth would have an effect. My thought process is that a pitcher would make more third outs thus turning the lineup around for the proceeding inning. The first team I chose was the Los Angeles Dodgers and the numbers were slightly surprising. The Dodgers only had their number two hitter hit second 39.9% of the time – slightly less than all three AL teams I looked at. All players had relative success but the takeaway here is that Manager Don Mattingly never hit arguably his best hitter, Adrian Gonzalez, in the second spot. The last team I looked at was the Chicago Cubs which was inspired by the research I did for my article on the lack of bunts used by Joe Maddon. Maddon also was noted for pitching his batter eighth, bucking the trend of most NL managers over the years. As for how that changed the numbers I was looking at – number two hitters hit second in an inning 40.7% of the time. This is higher than the Dodgers and right along the lines with the White Sox. Joe Maddon started the season switching between rookie Jorge Soler and his best hitter, Anthony Rizzo, in the second spot. After 25 games of this he started switching between Rizzo and another rookie, Kris Bryant. After Bryant started slumping after a great start, he went primarily Anthony Rizzo for over 30 games. Yet another rookie, Kyle Schwarber, was called up and almost immediately given the second spot. Primarily a power hitter, the move was unique, but Maddon has always been known as a guy who goes against conventional wisdom. The numbers do not really back up Maddon’s decision and the Cubs are the best example from the teams I researched on the “put your best hitter second” as Anthony Rizzo was very successful. While hitting second his batting average didn’t suffer noticeably either, as he seems to be a great situational hitter. With more RBI-prototypical guys like Kyle Schwarber and Kris Bryant it may make sense to hit Rizzo second next year with those guys behind him. What we’ve seen here is there is not an altogether correct answer on how to create a lineup and it is extremely dependent on what the rest of your lineup looks like as well. Jose Abreu and Anthony Rizzo are the best hitters on their respective teams, but there were more suitable players to hit behind Rizzo than Abreu. The Angels discovered that batting Trout second may have caused him to be treating his at-bats differently and realized that moving him back in the order allowed him to better match his skillset. Even one season is a small sample size and I look forward to returning to these lineups in 2016 and seeing what their scouting department has decided after presumably doing similar research.